In my book, simplicity is key. Minimal accessories is a great way to make it "all about the dress." Showcase the craftsmanship of a well made article of clothing. This beautifully simple camel colored dress with OTK (over the knee) socks and ankle strap clogs is a fall staple. Add a perfectly imperfect up-do, and it's little effort for an amazing outcome. Oh, including a pop of color with a yellow and rust colored clutch...check! I don't believe "you can't wear white after Labor Day". Living in Florida, we're lucky to get below 70 F come Thanksgiving day. This simple, short sleeved, ribbed sweater dress paired with black tights and black ankle boots is perfect for Florida fall/winter. Black and white is classic, and never goes out of style. Also, layering is important, so it'll be easy to throw on a jacket in the morning on the way to work (or play). This mix and match bedding is simple and colorful. Choose comfortable, quality linens over cheap and trendy (you'll be glad you did-- in a lifetime, we spend roughly 20 years of our lives sleeping). 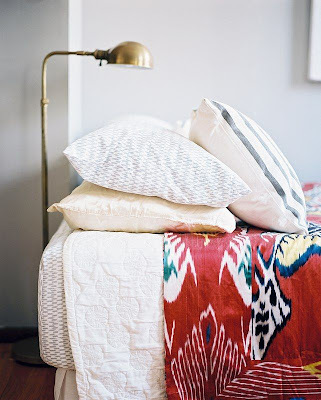 With a lovely brass floor lamp, you're ready to curl up with a book and a warm cup of tea. Keep is simple with large accent pieces. 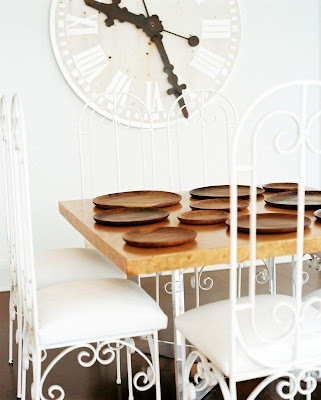 This wall clock adds the perfect contrast to stark white walls with it's dark metal hands. And, the curve details on the metal chairs add a nice feel to the natural wood and metal elements. Lately, I've been noticing lots of beautiful wallpaper. The trick is finding one that you won't say "What was I thinking?!" after a year. 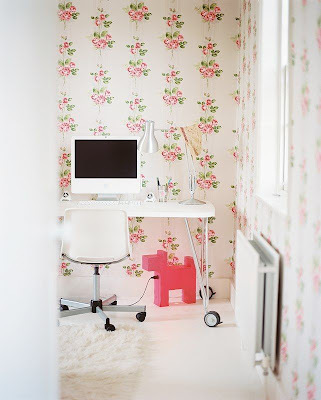 This simple office space utilizes a fresh floral wallpaper and pink accents to make it personal and feminine. The white furniture and brushed metal lamp adds functionality and simplicity.